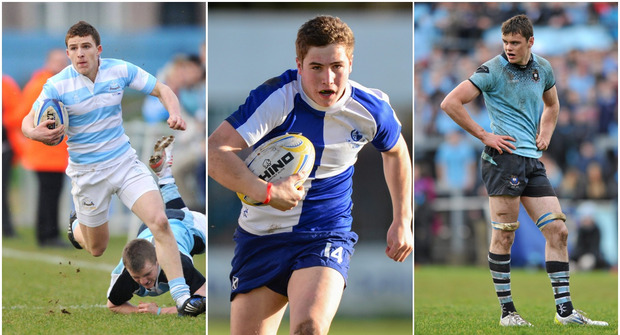 Andrew Conway (left), Jordan Larmour (centre) and James Ryan (right). Such is the rate with which young players from all four provinces are now making the considerable step up to the professional ranks, the school's game remains front and central in the development of Irish rugby. The standard of rugby across the board continues to rapidly increase and while Leinster are the front-runners in that regard, Connacht, Munster and Ulster will feel that the gap is closing. Turn up to most school's games nowadays and you will see talent ID scouts from the respective province as they look ensure that no potential future stars slip through the net. For those young players who don't get the chance to play school's rugby at a high level, there are other avenues in which they can catch the eye, but a quick glance at the current Ireland squad will show that the majority played school's rugby at one level or another. It helps too that professional coaches in this country are consistently showing a willingness to blood young players regardless of how soon they are out of school. Up north, Aaron Sexton who is still in school, regularly featured for Ulster 'A' as a 17-year old, and the sprinter looks certain to make the next step up as soon as he finishes. Less than two years ago, Michael Lowry (20) was guiding RBAI to a third consecutive Senior Cup title and earlier this month, he helped steer Ulster to their crucial Champions Cup victory over Racing 92. This time last year, Scott Penny was still in school and after scoring eight tries in seven Celtic Cup games for Leinster, the former St Michael's student has already started three games in the PRO14. Johann van Graan has handed Munster debuts to the likes of Fineen Wycherley and Gavin Coombes (both 21), while a host of other young talents, who have also impressed at school's level, will be hoping to do the same before the end of the season. Out west, Andy Friend has recognised the importance of developing from within and the Connacht head coach will be buoyed by the Westerners' recent success at underage level. 20-year old Colm de Buitléar is a good example of someone using one of the alternative routes to professionalism. The versatile back took up the sport in Connemara with An Ghaeltacht Rugbaí and was handed his professional debut in October against Bordeaux. All of the aforementioned young guns are hoping to blaze a trail and follow in the footsteps of most of the current Ireland squad, who were once on a similar path. The Moyross native's journey began in St Munchin's before he moved in second year to St Nessan's, a school that wouldn't be known for its rugby prowess. Given how good a flanker Keith Earls' father Ger was, it seemed inevitable that he would end up in the back-row and so it proved. It wasn't long before Munchin's came calling again however, and Earls' decision to return to the Corbally nursery in fifth year ended up being the right one as he switched positions to outside centre and inspired the school to the Senior Cup in 2006. Earls' crowning moment arrived in front of a large crowd in the decider at Thomond Park as his searing pace saw him score a try that Irish supporters have become used to seeing since he broke onto the scene as a 20-year old. Like Earls, Garry Ringrose went through his time in school with a considerable weight of expectation on his young shoulders. Comparisons, perhaps unfairly so, were regularly made with Brian O'Driscoll, another outside centre who quickly made a name for himself in Blackrock, and for the most part Ringrose lived up to the billing. An accomplished goal-kicker, who missed just one kick in four games in the 2013 Senior Cup campaign, Ringrose's all-round game had him marked out as a future star from early on and as soon as he lit up the final that year, Leinster were licking their lips at getting their hands on a supremely talented youngster. With just 16 minutes gone, Ringrose stripped his current Leinster team-mate Josh Murphy in a tackle before sprinting clear from 80-metres to score a sensational try. A star was well and truly born. The most recent graduate who has wasted little time in building on his exciting reputation from his time in St Andrew's, Jordan Larmour has only just begun to make his mark on the world stage. Regularly up against 'bigger' schools, Larmour invariably stood out in the centre where he played most of his rugby. In the 2014 Senior Cup semi-final, Andrew's were 35 minutes from causing what would have been a major upset against Clongowes with Larmour's scintillating try assist from just outside his own 22 setting them on their way. The Clongowes defence fell asleep after kicking to touch and Larmour punished them as his quickly-taken lineout ended up in him dancing his way around two tackles before offloading to his full-back for a wonderful score. It proved to be the first real glimpse of Larmour's mesmerising footwork. After two years playing Junior Cup, the second of which he captained St Michael's to the title (2012), James Ryan was quickly fast-tracked to the senior side. Ryan played that final win over Newbridge with a torn medial ligament, such was his relentless desire to avenge the previous year's final defeat. In the first round of that successful Junior campaign in 2012, Ryan scored an unforgettable try against Castleknock as he stepped in at out-half, burst through several tackles before turning on the after-burners and scoring from over 60 metres. Ryan was soon identified as the Ireland U-20s captain as he went from playing Senior Cup rugby in 2015 to making his international debut in 2017 – before having played a senior game for Leinster. Regularly spoken about as the most exciting player to come through school's rugby since Luke Fitzgerald, big things were expected of Andrew Conway. Scoring two sparkling tries in Blackrock's 2007 Junior Cup final win over St Michael's heightened those expectations, especially considering he had won a medal the previous year as well. A Senior Cup followed in 2009 when 'Rock saw off Terenure College when Conway once again crossed for a try on the big occasion. By the time he left Blackrock, Conway had become one of the most decorated school's players and even though he admitted recently that it didn't quite happen for him at senior level as quickly as he would have liked, the flyer has reignited his career at Munster and is currently in the form of his life. Make sure to pick up Tony Ward's comprehensive 2019 Schools Rugby supplement in tomorrow's Irish Independent.